Pipe insulation is a "once-and-done" improvement that saves energy and improves comfort and convenience. When you buy a new tank-type water heater with an ENERGY STAR® rating, you can be confident that the tank is well insulated. The blanket of insulation that surrounds the tank helps to minimize "standby heat loss" that can make your water-heating expenses much higher than necessary. Water heater insulation helps the hot water in the tank to stay warmer longer, so that the heating element (in an electric tank-type water heater) or burner (in a gas-fired model) doesn't have to come on very often. Although today's tank-type water heaters come with insulation, the same can’t be said for the hot water plumbing pipes that carry heated water to faucets, showerheads, dishwashers and washing machines. Without insulation, hot water pipes (and the hot water they contain) have no protection from the cool or even cold areas where they’re installed –like basements and crawl spaces, for example. As a result, the heated water in the pipes cools off, forcing you to wait a long time for hot water the next time you turn on the hot water tap. 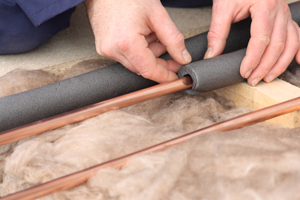 Pipe insulation reduces standby heat loss, so that your hot water arrives sooner. You won’t have to wait so long for hot water to arrive in the shower. This ends up saving water as well as the energy required to heat the water you use for washing. Experts in home energy performance have a saying: "Every little bit helps." Installing pipe insulation on your hot water pipes is one of those small improvements that you’ll appreciate for as long as you own your home. Because plumbing pipes come in different sizes and often run in cramped spaces, it's smart to have an experienced home energy technician perform this energy-saving upgrade. An experienced technician will determine what size and type of pipe insulation to use, and make all the cuts and other adjustments to properly insulate corner joints, fittings and straight runs. It's an improvement that requires no upkeep or additional expense once it's done. NOTE: Pipe insulation is a smart idea no matter what method is used to heat water. It provides the same benefits for hot water lines connected to a tankless water heater or an indirect water heater.